Skating Camp was organized during the month of February and March for the children of Sr. KG - C, D and E. This camp was organized to make children learn basic rules and terms of skating which they need to follow and also to make them physically strong and confident. During this period of one month children learnt how to skate, put brakes, sit on skates, pass through hurdles in different styles and also enjoyed playing games like ‘Tom and Jerry and Racing’. To exhibit their skills a special demonstration was organized on Friday, 21st March 2014, wherechildren enthusiastically and confidently displayed their skating skills in front of their parents. This was a day full of fun and a feeling of accomplishment for both, parent and child. On Tuesday 25th March, 2014 the students of Primary section had their Graduation Day for the Session 2013-2014. Congratulations for your achievement! Graduation is not the end, it is the beginning. The future belongs to those who believe in the beauty of their dreams. On Saturday 22nd March 2014, Pre Primary kids had their Graduation Day for the session 2013-14. Holi the festival of colours is one of the most popular, vibrant, exciting and fun festival of the year.It is a festival that is celebrated in our country by all religions.The children of Sr. KG section celebrated this festival on Friday, 15th March. Teachers discussed about the festival through Holi story slides and children had water play activity which they enjoyed by squirting, splashing and spraying water on their friends. Thus like all other festivals celebrated in school this was also one which was celebrated with fun and frolic. 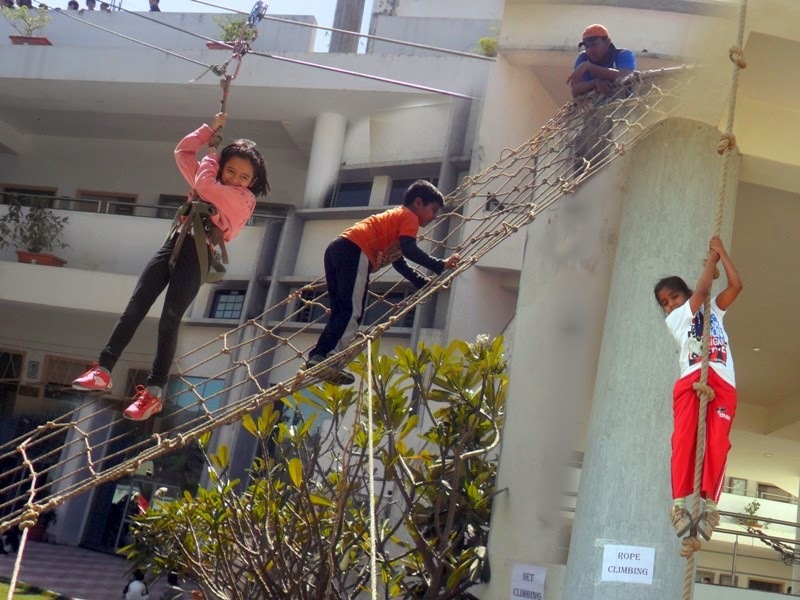 A thrilling overnight camp was organised at Witty International School, Udaipur. 200 students were divided into two groups i.e. Sr.Kg to Grade 2 and Grade 3 to 8. Wittians experienced the thrill of adventure. At the same time this programme aims at making the students more confident and competitive. In this camp students learnt many new things which would help them in becoming psychologically, physically strong and more confident. The main features of the camp were introduction to equipments used for mountaineering, rappelling, and river crossing techniques, knot tying exercises, obstacles and rope courses for confidence building and map and compass reading. All the aforesaid things were taught under the guidance of trained instructors and with advanced equipments. Wittians showed full enthusiasm and zeal in doing every activity. They were thrilled to have such an experience. “Poetry is to the heart, what music is to the soul” was the motivation behind the Poem Recitation Activity organized for the little Wittians of Nursery on Friday, 14th March, 2014. As we all know, Poem is meant for enjoyment and that’s what our children did, they got an opportunity to exhibit their talent and confidence. Overall, it was a learning experience for them. On Friday, 14th March 2014 Children of PG visited the School Garden. Children enjoyed watching different coloured Flowers in the garden. Children also enjoyed playing with their peers. On Thursday, 13 March 2014 little Wittians of Jr.Kg had a Poem Recitation Activity in which they participated with full vigour. They recited their favourite rhymes and came dressed accordingly. Children also used various props like cat, dog, car, magic wand etc. which made the recitation look more attractive. Students recited the rhymes with lot of energy and confidence. It was an excellent learning experience for the little students. Football, Football, everyone follows the herd. Football, Football, Football; or else they would be disturbed. My team have an aim, that they win every game. Little Wittians of Sr.Kg competed in a Football game. They showed their enthusiasm by cheering their peers and enjoyed participating in the Football game.